The Boys #29. For the build up to a big face-off between the Boys and the whole G thing. Then it all kicked off, and it was brilliant. The best thing about The Boys #29 is that it seems to be leading into soemthing a whole lot bigger. And also, The Boys #29 is great because Hughie was centre stage and he was brilliant, as human and humane as you are going to get in an Ennis comic. Bravo. This is an uncomfortable and hard to read issue at times, as we finally learn the truth about Godolkins recruitment tactics, his proclivities and Government / Big Business’ willingness to turn a blind eye to the whole mess. Hughie, who has led from the front throughout this storyline, and is rapidly becoming my favourite member of the team, is fired up and ready to make a stand against the forces of Godolkin…but to say anything else would ruin the surprise. But what a surprise it is. The art is exemplary, especially the final face-off which is an exceptional epic. The dialogue is sharp and pointed, the plotting tight. A highlight of the week. This issue, the culmination of the whole Godolkin / G-Men storyline, has a satisfying conclusion, showing that it isn’t always The Boys who have to clean up the mess that superheroes make. The Boys is going through a great run of form at the moment, so let us hope it continues. Also, The Boys hits 30 next month, a real landmark, and one to be celebrated. 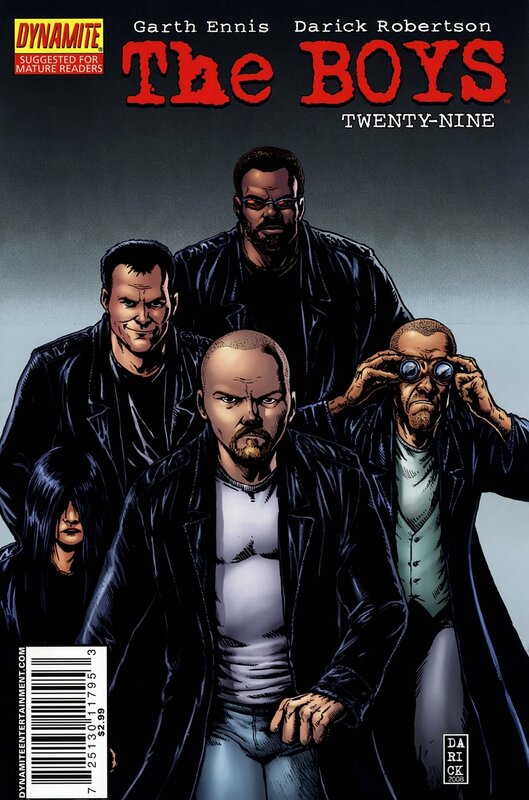 The Boys #29, published by Dynamic Forces, is out now.